It's interesting to look back at the early days of my blog, when I was all about those buttermilk biscuits. After spending a few years learning how to master the art of fluffy, tender, southern biscuits, it was time to move onto another project. Cornbread soon became my next obsession. A couple holiday seasons back, I shared my recipe for Sage Brown Butter Cornbread. The major key was adding all of the butter to the skillet, not in the batter itself. It was a departure from the recipes I'd followed off the back of the cornmeal bags. Just as I'd figured out a formula that worked consistently for biscuits, I developed a boilerplate recipe for my signature skillet cornbread. 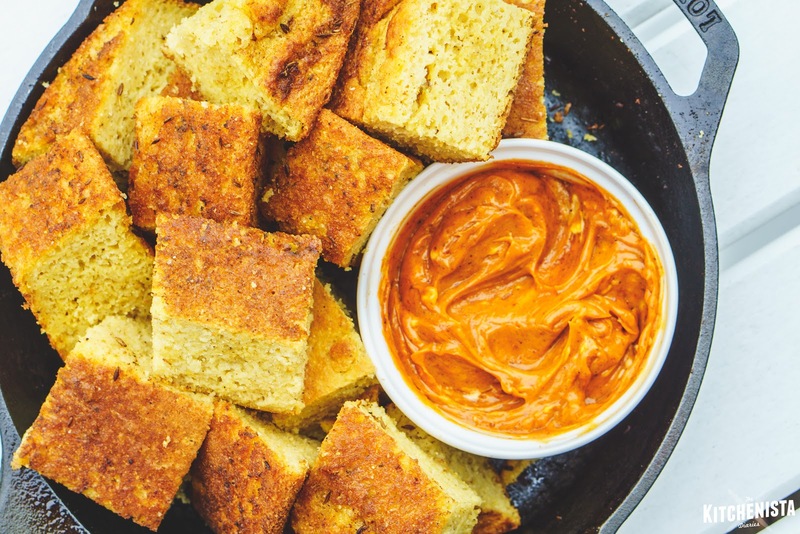 My version delivers a browned, crisp crust that aces the test for southern cornbread - but with a moist, airy, tender crumb that gives way to Yankee preferences. It's the best of both worlds and disappears within seconds at every cookout. 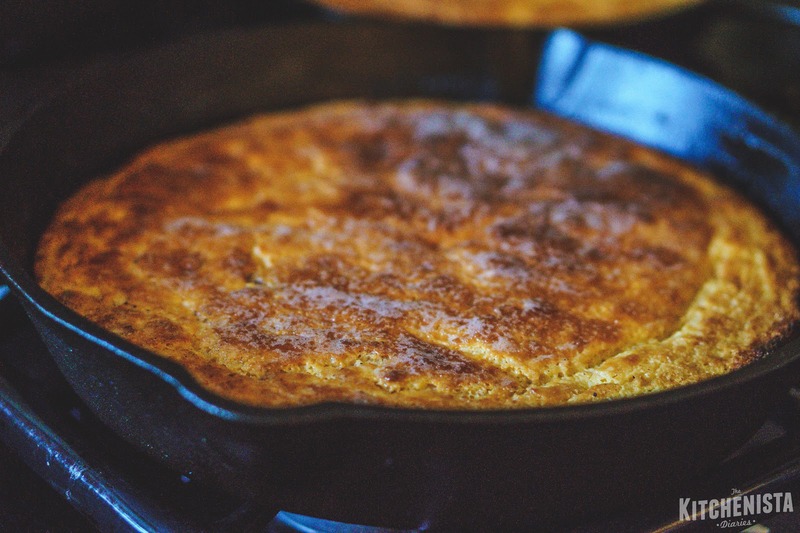 I posted my skillet cornbread recipe as a thread on Twitter awhile back, but it was time to give it a permanent place on the blog so y'all could find it more easily. 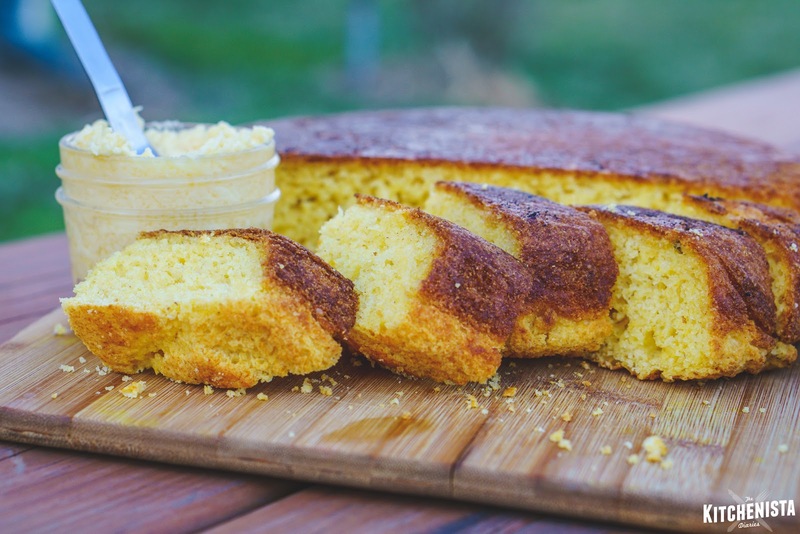 I've included some notes on the ingredients as well as inspiration for turning your cornbread game up a few notches! I use a medium-grind, stone ground yellow cornmeal for the best flavor and texture. Fine cornmeal will also work. Course ground cornmeal should be avoided unless you're certain you appreciate the texture - it can result in crunchier bits of cornmeal in the finished product. For less of a moist texture, use 1 egg, otherwise 2. You can also decrease the amount of flour and increase the cornmeal (still totaling 2 cups), for more of an old-fashioned texture. Low-fat buttermilk is okay here, since it is supplemented by sour cream. However, if you can find full-fat buttermilk that's always an improvement on flavor. Preheat oven to 400°F. 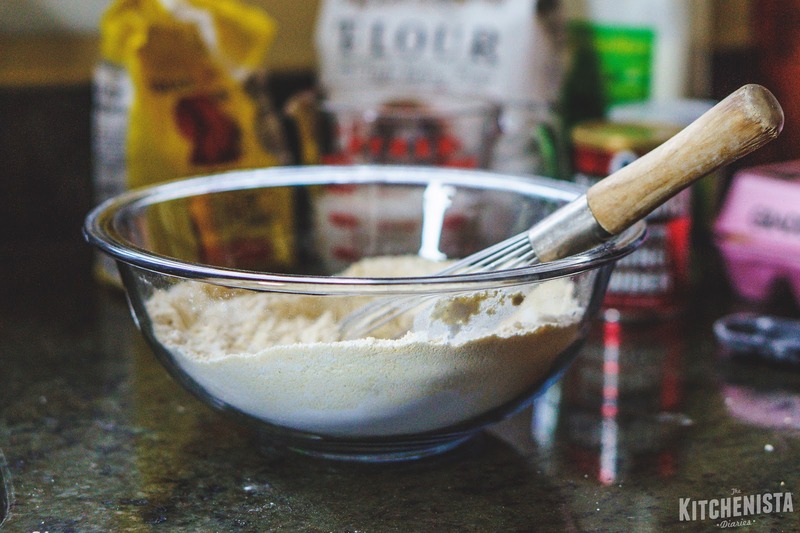 In a large bowl, whisk to combine the flour, cornmeal, baking powder, baking soda, salt, and sugar. In a separate bowl, whisk to combine the eggs, buttermilk, and sour cream. Over medium high heat, begin melting the 1/2 cup butter in your cast iron skillet. Make a well in the dry ingredients and pour in the buttermilk mixture. Whisk just until combined and no pockets of flour remain. Don't overmix, but if necessary add additional buttermilk. It should be lumpy and pourable, slightly thicker than pancake batter. When the butter is sizzling and has stopped foaming, pour the cornbread batter into the skillet. Smooth out the top of the batter. Transfer the skillet to the oven and bake for 20 to 25 minutes, until golden brown and a toothpick inserted into the center comes out clean. After removing the skillet from the oven, allow the cornbread to rest for 5 minutes. Place a cutting board over the skillet. With your other hand under the skillet (use oven mitts), flip the cutting board and skillet over together onto your counter, so that the skillet is inverted. Lift the skillet up, revealing the golden crust. 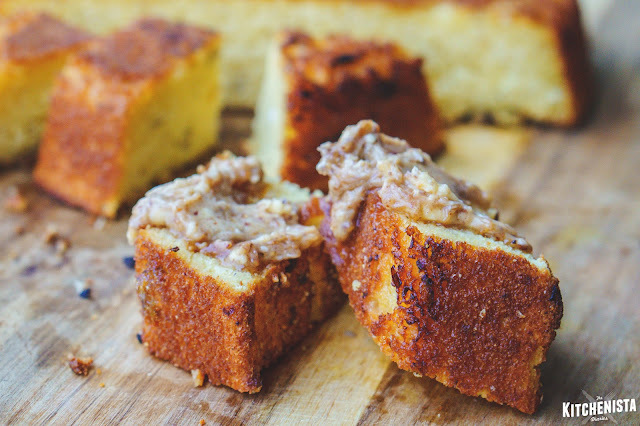 Slice cornbread with a serrated knife. Serve warm, with additional butter. 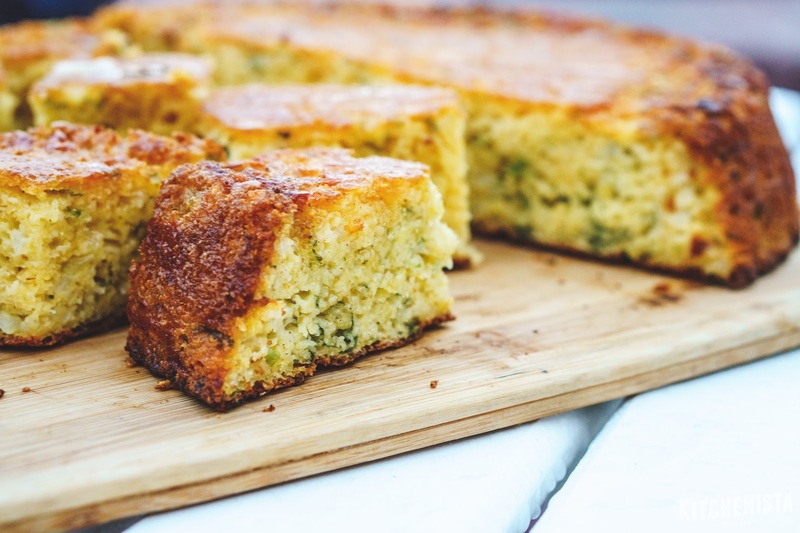 Cheesy Jalapeno Cornbread: To the batter, stir in 1 cup shredded quesadilla or Monterrey Jack cheese, 1/4 cup finely chopped cilantro, and 2 diced jalapeno peppers. For a sweeter cornbread, increase sugar to 1/2 cup. Alternatively, add 1/4 cup of honey or maple syrup. For a savory cornbread, reduce the amount of sugar or leave it out. For cheesy cornbread, stir in 1 cup of shredded cheese to the batter. Choose a flavorful cheese that melts easily, such as sharp cheddar, gouda or pepper jack. Other add-ins that work well include crumbled cooked bacon, diced jalapeno peppers, poblano peppers, sauteed onions, pureed fresh corn, fresh herbs, or spices. If you don't have a cast iron skillet, you can prepare the cornbread in a 9x13" cake pan. Grease the pan with 2 tbsp of the butter. Melt the remaining butter and whisk it in with the wet ingredients. Bacon grease, lard, duck fat, or beef tallow can be substituted for the butter, or used in combination with butter. Try serving your cornbread with a fun and flavorful compound butter. Some ideas are below! Harissa Honey Butter: Allow 1/2 cup of butter to soften at room temperature. In a food processor, stand mixer or manually with a whisk, incorporate 2 tablespoons of harissa paste and 2 tablespoons of honey, or adjust the amounts to your taste. Maple Pecan Butter: Allow 1/2 cup of butter to soften at room temperature. In a food processor or by hand, finely crush 1/4 cup of toasted pecans. Add the softened butter, 2 tablespoons of real maple syrup, 1 tablespoon of brown sugar, a pinch of salt and a pinch of cinnamon. Pulse or whisk until pecans are evenly distributed. 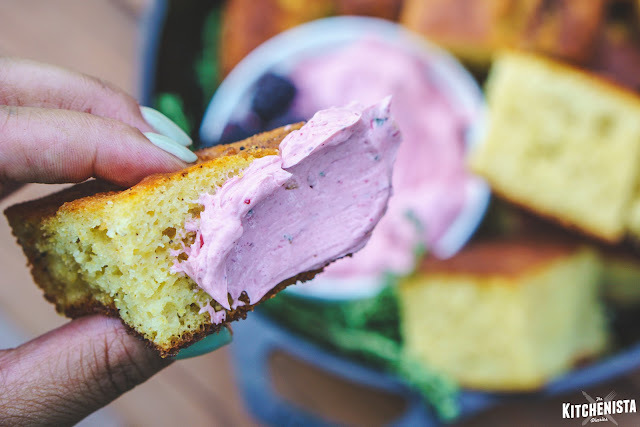 Whipped Blackberry Thyme Butter: Allow 1/2 cup of butter to soften at room temperature. Mash 1/3 cup fresh blackberries and press through a fine mesh sieve, to yield 2 to 3 tablespoons of strained blackberry puree. Very finely mince 1/2 teaspoon fresh thyme leaves (preferably lemon thyme.) Zest 1 teaspoon of lemon rind, avoiding the white pith. In the bowl of a stand mixer or using an electric hand mixer, whip the butter, blackberry puree, thyme and lemon zest until fluffy. If blackberries aren't very sweet, add a tablespoon of honey or maple syrup. Season with a pinch of salt and cracked black pepper. Looks so good! Curious what GF flour you are using these days in your cornbread?